Like too many cooks, can too much anticipation spoil the broth? Well, “spoil” is perhaps a strong word, and “broth” an entirely incorrect one. What we’re getting at is, could Game of Thrones’ season 8 premiere have survived the fan expectations that had been built up around it? Having watched episode 1, here’s a short answer: No. In fact, this may be one of the weakest opening episodes in Game of Thrones’ seven-season-spanning history. We’ll hasten to add, it’s not bad. It’s just — confused. For instance, the episode’s major set piece — Jon and Daenerys riding over the frozen Northern landscape with Viserion and Rhaegal — is pretty much showboating. Ever since Drogon, Rhaegal and Viserion grew too large for Daenerys to carry around, we’ve been reminded time and again that these are dangerous “children”; their adolescent years are so bad, Daenerys has to lock Viserion and Rhaegal up in the catacombs under the Great Pyramid at Meereen. 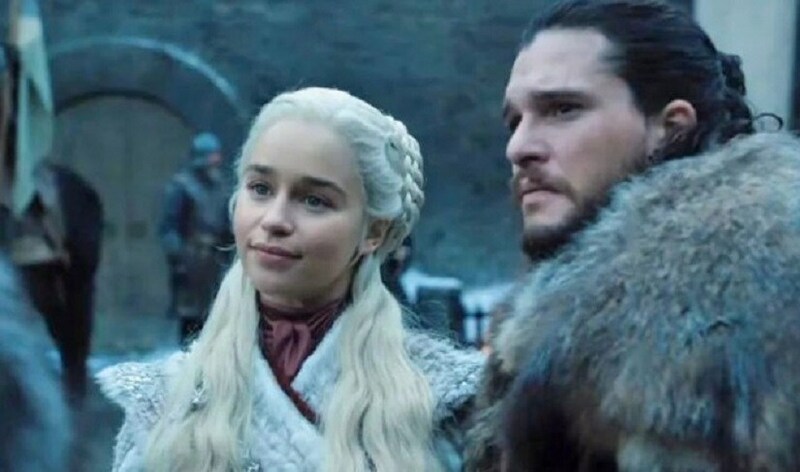 So to have her nonchalantly tell Jon to hop onto Rhaegal for his first-ever solo dragon ride; and then for it to be all treated like a medieval fantasy version of a rollercoaster (okay, a rollercoaster on Speed) is well — odd. The opening scene, where the Starks are waiting for the royal party (and Jon) to arrive at Winterfell was a bittersweet throwback to how they all lined up to greet Robert Baratheon. Arya looks on indulgently as a little boy scampers to find the best vantage point from which to observe Daenerys. It’s what she tried to do too, as a child — as did Bran. There’s another callback towards the end of the episode, when we see the little Lord Umber — killed by the White Walkers and nailed to the wall of his own hall — open his bright blue eyes and startle Tormund. It reminds us of the dead Wildling girl who startles Will (of the Night’s Watch) in the same way. Of which, there were plenty. The one between Jon and Arya of course was the most anticipated (there’s that word again), but while it may fallen a few notches short of that absolutely heartwarming Sansa-Jon meeting at Castle Black, it still was lovely. Both Arya and Jon have seen too much and experienced too much, and some restraint is bound to have crept into their manner. But the way they compare their respective swords under the weir tree — Needle vs Longclaw — was a sweet touch. In fact, even the moment when Jon rushes to Bran on first entering Winterfell, was rather poignant. Bran was a little boy when Jon left home (a little boy in a coma, moreover). The way he ruffles Bran's hair has "big brother" written all over it. Except of course that Bran is no longer little, and Jon is more than the protective older brother he used to be. Tyrion and Sansa's meeting could have been done a little better. They handle the hot potato of her disappearance with aplomb ("I can imagine you not wanting to stick around," Tyrion tells her, referencing Joffrey's wedding. "It did have its moments," she replies, with a slight smile) and are respectful towards each other's status as survivors. But on the whole, there is little real depth to this moment between a former husband and wife with so much shared history of suffering. Arya gets a good deal with the Hound and Gendry, both of whom she runs into at the castle foundry. The Hound and Arya are as prickly as ever towards each other and they speak of how she left him dying, after stealing his purse. What we're thinking of while this is going on, is how Jaqen H'ghar catches Arya in a lie every time she says she hates the Hound. With Gendry, Arya is all sass, while he teases her for being a rich girl and calls her "milady", referencing their last conversation when she asked him to be her family, but he decided to stay back with the Brotherhood without Banners. And last, that short-but-left-us-with-questions scene between Jaime and Bran. Jaime (can we take a minute to appreciate the rugged goodness that is Nikolaj Coster-Waldau?) is the reason Bran's in a wheelchair and we expect that being faced with the results of his vile actions in the flesh will lead Jaime down some pretty self-flagellatory paths. We're keen to see more. Definitely not Tyrion-at-the-top-of-his-game level funny, but there were some laughs in this episode. Like Ed holding up a torch to Tormund's eyes and shouting out, "They're blue, they're blue" as an alarm that he's a wight. Only to have Tormund counter: "My eyes have always been blue." Oh Tormund, we love you. Okay, no matter how many quibbles may have popped up in our minds, our hearts were feeling every moment of this episode 1 journey. Oh look, the dragons! Oh look, the Starks! Oh Samwell, aren't you sweet! Ser Jorah, Ser Jorah! You get it. Daenerys was too smirky. 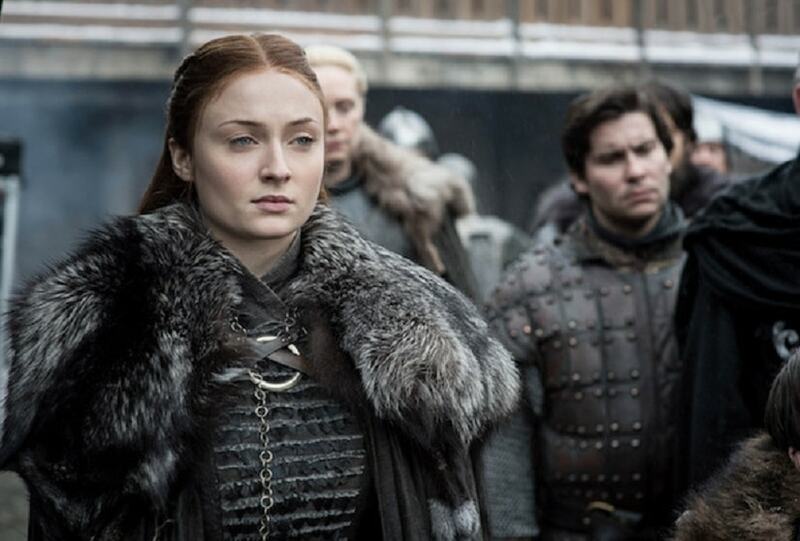 Sansa was too icy. We honestly don't want another replay of the Cersei-Margaery enterprise. Smart, ambitious women can get along — even if they view each other as competition. They're better than this pettiness. Did we really need to see three naked women get it on with Bronn? No, we didn't. He's a witty guy who manages to steal the scene whenever he's in the frame. Give him something better to do than lie back in bed. And the ladies as well. So yes, being an all-seeing, all-knowing entity was bound to give you something of a personality makeover, and yes we saw a goodish glimpse of affect-less Bran in season 7. But he's spent a sizeable amount of time in this episode just staring at people. Sometimes from close up, sometimes from a distance, but always the staring. Tyrion gets the stare treatment, Jaime gets the stare treatment, Sam gets the stare treatment. When he isn't staring, he's making doomsday pronouncements sotto voce. "The Knight King has breached the Wall." "He's got your dragon." Reminds us of the kid from Scary Movie, going: "Your period starts in 3, 2, 1..."
Does anyone really care about Euron Greyjoy? Has there been a duller soul with so much bombast in Game of Thrones before? Mace Tyrell would be preferable to this particular Greyjoy. Why does Cersei have to deal with Euron Greyjoy? This woman has spent the last seven seasons matching her wits with the best in the West and usually coming up trumps. In this episode, all she got to do was talk about how much she wanted elephants in her army, sleep with Euron, and answer idiotic questions about how he "compared" to Robert and Jaime. Cersei looked tired — like absolutely fatigued — and no, we don't think it's because she's been so busy outmaneuvering her enemies. She seriously needs to get her claws into a nice evil scheme and she'll be more like her sprightly, malicious self again. Among the many odd things we saw in this episode was Davos, Varys and Tyrion having a conversation about a matrimonial alliance between Daenerys and Jon, and how they (the trio mentioned) are all so old. Uh, Ser Davos, yeah. Varys, mayyybe. But Tyrion? Our Tyrion? Tyrion will never be old. Game of Thrones does have a problem with its smartest characters — beyond a point, the show doesn't know how to use them. It wasted Littlefinger. Varys is going the same way. And if the showrunners don't pull up their socks over the next five (gasp, is that all there is? No, please give us some more!) episodes, Tyrion and Cersei won't have much more to do than fixing up marriages and hobnobbing with the Euron Greyjoys of the Seven Kingdoms. And no amount of flying dragons will distract us from that.